The second volume in author Joseph Lamere’s successful DRAMATIS PERSONAE series from Pro Se Productions is now available in digital format. DRAMATIS PERSONAE: CHARACTER FLAWS returns to a world where a man can be both real and fictional, human and character, anything can happen. And usually does to Diogenes Ra. Mystery, drama, action, and humor all come together in the follow up to DRAMATIS PERSONAE: PUBLIC DOMAIN. 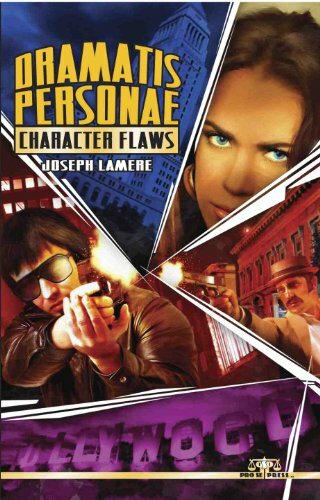 Featuring a gritty cover by artist Jeff Hayes and logo design and Ebook formatting and design by Russ Anderson, DRAMATIS PERSONAE: CHARACTER FLAWS is now available as an Ebook at Amazon, Barnes and Noble, and in most available formats at www.smashwords.com for $2.99. TWO COMPANIES, ONE PULP HERO AS HE'S NEVER BEEN SEEN BEFORE- YOUNG DILLON IN THE HALLS OF SHAMBALLAH DEBUTS.